Caretaker manager Sam Collins admits he is unsure how long he will be left in temporary charge of Hartlepool United. Pools were beaten 2-1 at home by League One side Sheffield United in Tuesday's Johnstone's Paint Trophy tie, the first match since Colin Cooper's exit as manager three days earlier. Collins and fellow coach Stephen Pears were in charge of first-team affairs. "Results could dictate the future but while I'm in charge players will give 100%," Collins told BBC Tees. "What we will get is players who do that, I can accept losing but I can't accept players not trying." 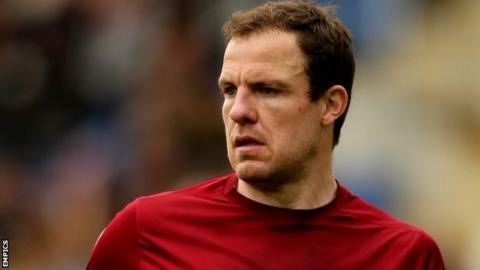 The Pontefract-born 37-year-old has served Pools well as a player since his arrival at Victoria Park in January 2008, making 263 appearances and scoring six goals from centre-back. He has so far started four games for League Two's bottom side this season, but has not made an appearance since 30 August. Collins was named as Cooper's assistant in May, and feels he has a solid grounding in what it means to be a "Poolie". "I love the club and I understand the way the fans think," he added. "It's working class people who want people to work hard and I understand it. "When I one day become a manager I want them to work hard, and my players who played tonight - everyone of them did that."